Psoriasis – Why is it such a Nuisance to Deal With? Psoriasis is a chronic non-contagious skin condition that produces plaques of thickened, scaling skin. It is a condition that can commonly affect you elbows, knees, scalp and the soles of your feet. There is a spectrum to the condition ranging from mild (limited involvement of small patches of skin) to large thick plaques to red inflamed skin covering the entire body surface. 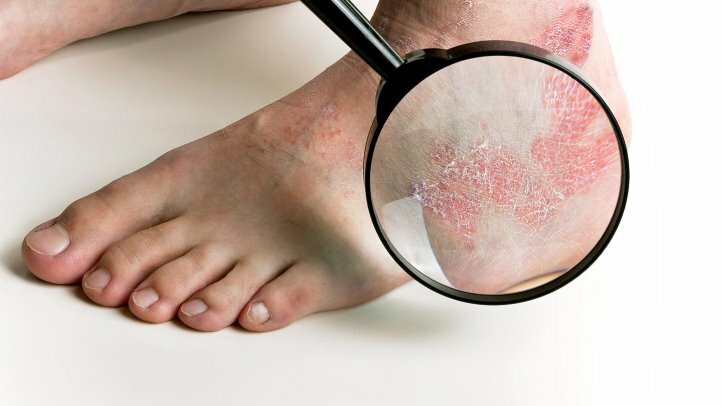 Psoriasis is considered an incurable skin condition that is considered an inherited genetic deficiency, it can periodically improve and worsen by itself, it can also clear up and stay in remission for years, however many individuals have reported an increase or deterioration of their psoriatic symptoms during the winter period. If you are experiencing any of the signs and symptoms mentioned then you may have psoriasis. Book an online appointment with our podiatrists now to assess your feet.